There are 3 sets of codes for this popular adventure. Versions A and B are for the original title. (The third set of codes is for the Sega Classic version). The Codes will help you vanquish the evil Neo Zeed army. With Code 5, shurikens and swords don't hurt you. Code 8 lets you use Jitsu of Mijin with no loss of life. 1 Unlimited Men - In round 4-2, there are many power-ups hidden that are revealed only by shooting them. On the first platform, jump and shoot and you'll reveal a 2-up on the platform across your position. Get it, die, and repeat! There's another 2-up on level 3-2 - go to the second elevator and locate the crates that are in the middle of the screen (on the second level). Then shoot the bottom-left crate until the 2-up appears. 2 Special Bonus - Finish any level with enough shurikins to equal 11 times the number of lives remaining, and you will receive 30,000 bonus points. 1 Infinite Shurikins In the option screen, set the number of shurikins to 0 and wait about 20 seconds. The 0 will turn into an infinity symbol, giving you an unlimited number of shurikins. order to boost the platform's slow sales. the Genesis so far as is known. Revenge of Shinobi - A very fun and hard game in which you play Shinobi and have to rescue some girl. Spiderman and Batman make an appearence in this one. Though they both take their names litterally in appearance :) Lots of cool attacks and great music, don't miss this title. Shadow Dancer - This a side story quest in which Shinobi actually get's a dog to help him out! This game is MUCH more like the original than Revenge of Shinobi. It's because in Shadow Dancer, you have one hit kills and you have rescue people, like in the original. Another great game. Shinobi 3 - Wow, this game has some really fast paced action scenes and it's lots of fun to play, adding new elements to the Shinobi series. A Game Genie cartridge is required to use the codes featured below. Turn off the Game Genie to advance to the next level. i can play this game all day is good. hey jan is me damin! hey! jan is my best friend we love shadow dancer. bladesaw babe is the best boss in the game. i love shadow dancer and bladesaw babe they are the coolest! shadow dancer best genesis game. shadow dancer great to fight in this game. hey jan i see your post now. shadow dancer is too great!i love it. you see me jan im right here. The Shadow Dancer are far more similar to Shinobi(SMS), objective(rescue people) and the boss mode. Nevertheless, the game mode on using kanata only can solve those drawbacks. The game level is quite easy, not many changes in enemy, but the background graphics solve that problems. There are another main problem with the game, the ending is too short (only a picture for nothing! :( ), can't fullfil the need for "first few time players"
But in general, the game play are very good!! must try for action gamers! 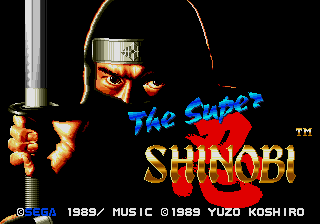 Shinobi 3 was a very fun game to play. The music at times was very heart pounding and fit the gameplay. This game deserves a lot better review than it got. These games are soo amazing! They are really fun to play! And playing as a Ninja is really cool! The third game in the series is really great! The grafics are quite good to! The Saturn version of the game is better thought. yeah, shinobi is a really fun game. i think the third is really the best,but i havent played much of the shadow dancer one. its pretty entertaining at that too! SAMURAI! just like me! A great fighting style game! This is a really fun game series that is still realistic even though you face Spider-man and everybody blows up as if their robots. But I find it a little to hard on certain points. 8.5! I wasn't keen on Shinobi 3, but Revene I LOVE, and Shadow Dancer is also great. 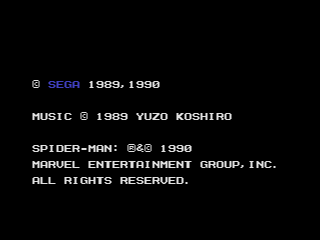 There were 4 shinobi related games released on the SMS too: Shinobi, Shadow Dancer, Cyber Shinobi and Aex Kidd In Shinobi World. this game is the best. how could you guys not like this game its awsome. i make game genie codes for this game too.i have some codes too this game now. man i love this game i can play this game like a pro. yeaaa i love this game. i have alot of game genie codes for this game. shadow dancer is the best!!! shadow dancer is all that! shadow dancer is the bomb! shadow dancer is the best game ever!!! Musics are excellent, gameplay is perfect. Shadow dancer is nicer graphicaly but a little too easy and short. shadow dancer is the best for the genesis!!! shadow dancer yea get this game. To me, Revenge of Shinobi was excellent because it brought NEW life to the Shinobi series and became the blueprint for further Shinobis (if that's even a word). If it weren't for Revenge, we would have never seen the great gameplay additions such as double jumping and multiple shruiken throws. 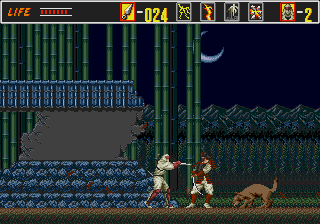 As well, the sense of style that Revenge has would not be seen in Shinobi 3, Legions, or the 128-bit versions. 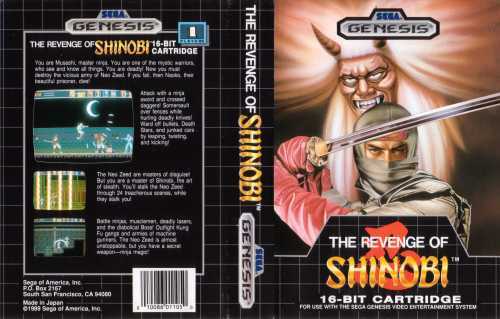 And of course, the tracks on Revenge are outrageous--from the great 1st level music (The Shinobi) to Chinatown to one of my personal all time favorite game musics--Sunset Blvd. But for playability, I'd have to pick Shinobi 3. 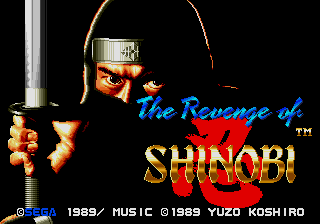 Revenge was good (I don't think it's as impossible as the last guy said) but could have used some gameplay improvements and Shadow Dancer was more in line with the arcade versions of Shinobi. hey wats up my name is Mike and i really like the shinobi games. i love playing them they are really fun hey can you people please tell me where i can buy that game at or at what website to download it at. I have downloaded it before but my demo time ran out. so can you write to me at dragoonmike1987@aol.com thank you so much. MIKE, p.s. the shinobi games i play are shinobi 3 return of the ninja master, and revenge of shinobi those are the ones that i want. I loved the Shinobi series. They all had great graphics for the time, I mean, Shadow Dancer looked 3 years older than it really was! And Shinobi 3... wow! That's my fave. shadow dancer is the best! i love this game don't you? jan bladesaw babe is the best right! shadow dancer rules big time. yep i can never get tireded of playing shadow dancer. shadow dancer will always be a ninja. shadow dancer is the best game super ever. jan i post on shadow dancer genesis board. hey jan keep pushing the refresh button to get more numbers. thats what im doing. Revenge of Shinobi was okay. The game is difficult, that's okay, but at times I just want to shut off the game and go do something else. That damn maze toward the end of the game is enough to make you go crazy. Shadow Dancer was an average port of the arcade version. The dog is a big bonus, as it allows you to get some of those tricky enemies. I love Shadow Dancer because of its non-shriken(sp?) mode which allows you to attempt the game with just your fists, feet, sword, and dog (except boss stages). 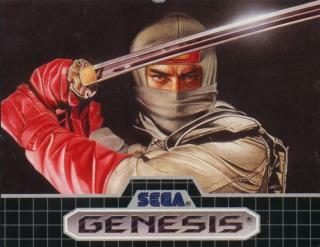 Shinobi III was the best in the series. The music, graphics, and game play are excellent. Even though this game tried at new things (jet board, horse, the jump kick, running slash with the katana...) it scored big in my eyes. The only regret I have is that the game doesn't have a no-shuriken mode like Shadow Dancer. Yeah, you can set the amount to 0 in the options, but it's too easy to pick them up. Graphics: Enmey sprites need more detail, as does many other things. Sound: Music? It's alright. Sound effects? There O.K too. Game play: Great fun but some time be a bit annoying. Storyline: One second you are a strange looking milertary aitcraft fight a brain in a jar. The next, you are in a scrapyard fighting the Terminator. And THEN you are fightng Spiderman who then turns into Batman. Then you must battle Godzilla. Confused? So am I. The intro is kinda misleading. Life span: Hmmm... its so-so. Overall: Great fun but dosn't last very long.